This machine comes with an adjustable roll distance and each axle has its own motor. This is machine is free of maintenance with extra benefit the roll diameter is small, so small potoateos can be transported and are not left between the rollers. Also the RR can be equiped with spiral rolls so the potatoes can be turned in two directions. The RR can directly be connected to the Boxer with a under conveyor belt. 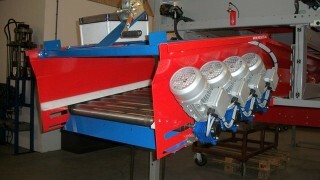 When using a potatocare spraying system you can treat the product directly from out of the box.